Interview 8/4 at 8 PM cet. Critics and fans alike hail pianist and composer SATOKO FUJII as one of the most original voices in jazz today. A truly global artist, she splits her time between Berlin and Japan and tours internationally leading several ensembles. Just as her career spans international borders, her music spans many genres, blending jazz, contemporary classical music, rock, and traditional Japanese music into an innovative synthesis instantly recognizable as hers alone. Her wide-ranging compositions can incorporate the simple melodies of folk song, the harmonic sophistication of jazz, the rhythmic power of rock, and the extended forms of symphonic composers. Although Fujii’s compositions are full of sudden shifts in direction and mood, the extremes are always part of a greater conceptual whole. 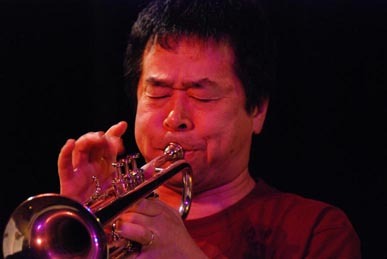 As an improviser, Fujii is equally wide-ranging and virtuosic. In her solos, explosive free jazz energy mingles with delicate melodicism and a broad palette of timbre and textures. Born on October 9, 1958 in Tokyo, Japan, Fujii began playing piano at four and received classical training until twenty, when she turned to jazz. From 1985–87, she studied at Boston’s Berklee College of Music, where her teachers included Herb Pomeroy and Bill Pierce. She returned to Japan for six years before returning to the US to study at the New England Conservatory in Boston, where her teachers included George Russell, Cecil McBee, and Paul Bley, who appeared on her debut CD Something About Water (Libra, 1996). Since then Fujii has been an innovative bandleader and soloist, a tireless seeker of new sounds, and a prolific recording artist in ensembles ranging from duos to big bands. She has showcased her astonishing range and ability on nearly 70 CDs as leader or co-leader in less than 20 years. With each new recording or new band, she explores new aspects of her art. Between 1997 and 2008, her New York trio with bassist Mark Dresser and drummer Jim Black released seven critically acclaimed CDs. Cadence magazine described the group as “Beautiful and exciting by turns, and sometimes both at once.” Jason Bivins inSignal to Noise, praised the “dynamite unit” for its “improv delirium, hot grooves, and melodic dances. In 2004 trumpeter/husband Natsuki Tamura joined this trio to form the Satoki Fujii Four, which released the critically acclaimed Live in Japan 2004 and 2006’sWhen We Were There. In 2001 came the radically different Vulcan (Libra Records), an avant-rock/free jazz fusion album by a new group, the Satoko Fujii Quartet featuring Tatsuya Yoshida of the Japanese avant-rock duo, The Ruins. “The sensibility here is aggressive to the point of primitive,” said Bill Bennett in JazzTimes. “Vulcan is … a masterpiece of jazz expression.” Between 2001 and 2007, each of the Japanese quartet’s five albums, including Zephyros (Polystar, 2004) and Angelona (Libra, 2005), received equally enthusiastic approval. Toh-Kichi, her duo with the quartet’s drummer Yoshida, released CDs in 2002 and 2004. However, Fujii’s creative ideas for large ensemble cannot be fully encompassed by a mere two big bands, and she has gone on to work with two others―Orchestra Nagoya, with which she as recorded three CDs since 2004, Orchestra Kobe. In 2006 she released an unprecedented four CDs―one by each of these orchestras―at one time. Even four orchestras is not enough for the prolific composer-improviser. At the 2013 Chicago Jazz Festival she premiered a fifth big band, the Satoko Fujii Orchestra Chicago. As the new century progressed, Fujii continued to establish new ensembles. In 2006 came the co-operative trio Junk Box with Tamura and percussionist John Hollenbeck. In addition to leading her small and large ensembles, Fujii has also engaged in many collaborative duo projects and ad hoc groups, and appeared as a member of ensembles led by others. With violinist Carla Kihlstedt, she has made two CDs, including Minamo, which Ben Ratliff of the New York Times says “is extraordinary, a series of tight, dramatic events.” She has also released a limited edition duo recording with pianist Myra Melford, Under the Water. A meeting between Fujii and Tamura and Dutch pianist Misha Mengelberg and trumpeter Angelo Verploegen is documented on Crossword Puzzle. She has also toured and recorded with saxophonist Larry Ochs’ Sax and Drum Core, and appeared on albums by drummer Jimmy Weinstein, saxophonist Raymond McDonald, and Japanese free jazz legend, trumpeter Itaru Oki. She is a regular member of Tamura’s Gato Libre quartet, in which she plays accordion, and First Meeting, and played synthesizer in his quartet between 2002 and 2004. In 2013, Fujii also set off on a new musical adventure with the Satoko Fujii New Trio, featuring bassist Todd Nicholson and drummer Takashi Itani―her first piano trio since 2008. The group released their debut recording, Spring Storm, that same year. Earlier bands led by the constantly exploring trumpeter have been very different in character. Peter Marsh of the BBC had this to say of the 2003 Natsuki Tamura Quartet release Hada Hada: “Imagine Don Cherry woke up one morning, found he'd joined an avant goth-rock band and was booked to score an Italian horror movie. It might be an unlikely scenario, but it goes some way to describing this magnificent sprawl of a record.” The collaborative trio, Junk Box, which he co-founded in 2006 along with pianist Fujii and drummer John Hollenbeck, plays Fujii’s “composed improvisations,” graphic scores that take “ensemble dynamics to great creative heights,” says Kevin Le Gendre in Jazzwise. Their music “is full of bluster and agitation that nonetheless retains moments of great melodic beauty, usually by way of concise, pertly pretty motifs that trumpeter Tamura plays in between bursts of withering roars that often dissolve into austere overtones.” Cut the Rope, the debut release by his most recent quartet, First Meeting, featuring Fujii, drummer Tatsuhisa Yamamoto and electric guitarist Kelly Churko, “is a noisy, free, impatient album, and ranks among Fujii and Tamura’s most accomplished,” according to Steve Greenlee of the Boston Globe.